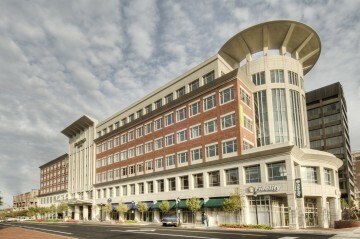 A six-floor, 63,000 square foot Class A office building located in the center of Greenville’s award-winning Main Street in the heart of a premier mixed-use project. Office building tenants enjoy on-site access to a multitude of amenities, including a Courtyard Marriott, one of Greenville’s finest restaurants in Rick Erwin’s Nantucket Seafood Grill, and a 14,000 square foot landscaped plaza that hosts many of the city’s outdoor activities. Property’s tenants include Greenville’s best in class for real estate, insurance, financial planning, accounting, technology and retail/restaurants.